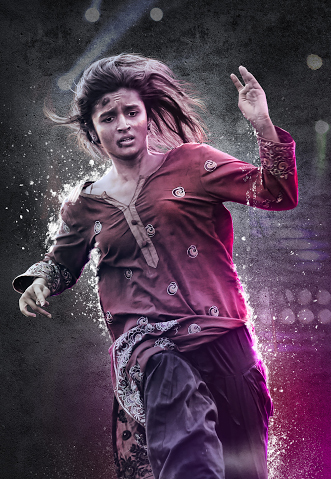 Bollywood’s cutest star Alia Bhatt is all set to surprise and shock her fans with her new avatar in ‘Udta Punjab’. You will be surprised to see this cute star playing the role of a Bihari migrant worker in the film for which she had also learnt a local distinct dialect for the movie. It was just today that, Alia Bhatt shared the first look of herself from the movie on her twitter account. Fans and viewers who were going gaga over the other three star of the film went berserk over her look and dialect. From the past few days, makers have been revealing the looks of Shahid Kapoor, Diljit Dosanjh and Kareena Kapoor Khan. Fans have a little more patience, for the trailer of ‘Udta Punjab’ that will be out tomorrow, April 16. This movie is Abhishek Chaubey’s directorial venture that will hit screens on June 17.